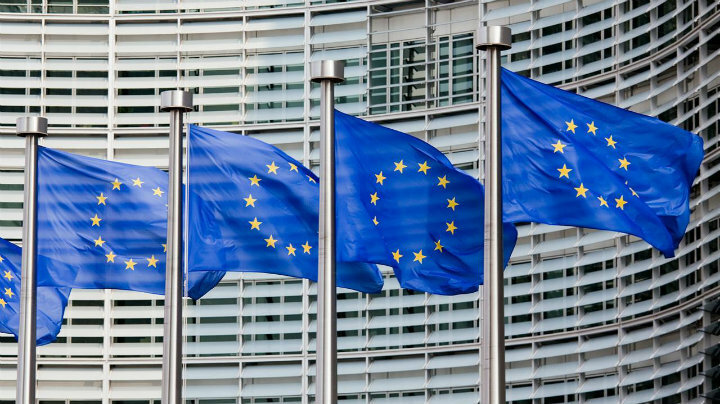 The European Union has called on political parties in the Maldives to engage in dialogue to resolve a deepening political crisis. Nearly 200 protesters were arrested from the anti-government mass rally following a police crackdown, including Adhaalath Party (AP) president Sheikh Imran Abdulla and main opposition Maldivian Democratic Party (MDP) chairperson Ali Waheed. The opposition ‘Maldivians against tyranny’ alliance had vowed to bring president Abdulla Yameen to the negotiating table through the mass rally. “The EU delegation is especially disappointed because of the reassurances which the visiting EU [heads of mission] had received from all major Maldivian political parties and the government that every effort would be made to ensure that peace would prevail on 1 May,” reads a statement released yesterday. The opposition May Day protest began peacefully with an estimated 20,000 supporters marching across the capital’s main thoroughfare Majeedhee Magu, calling for an end to the government’s “tyranny” and demanding the release of former president Mohamed Nasheed, ex-defence minister Mohamed Nazim. However, clashes erupted when protesters attempted to break through police barricades to perform sunset prayers at the Islamic centre. Protests are prohibited at the Republic square or the restricted ‘green zone’ in front of the mosque. Police cracked down with tear gas, thunder flashes, stun grenades, and the indiscriminate use of pepper spray. Later in the night, a Specialist Operations (SO) police officer left behind after a baton charge was tripped and severely beaten by protesters. He was sent to Sri Lanka for medical treatment along with another officer injured after a protest pickup charged through police lines at dusk. The president’s office spokesperson Ibrahim Muaz Ali declared after Sheikh Imran’s arrest that the government will no longer hold discussions with the Adhaalath Party leader. The EU parliament meanwhile passed a resolution last week calling on member states to issue warnings on the Maldives’ human right records on their travel advice websites and demanding the release of ex-president Nasheed. In a visit to Sri Lanka, US Secretary of State John Kerry echoed the calls and warned that democracy is under threat in the Maldives. “We’ve seen even now how regrettably there are troubling signs that democracy is under threat in the Maldives where the former president Nasheed has been imprisoned without due process,” he said. 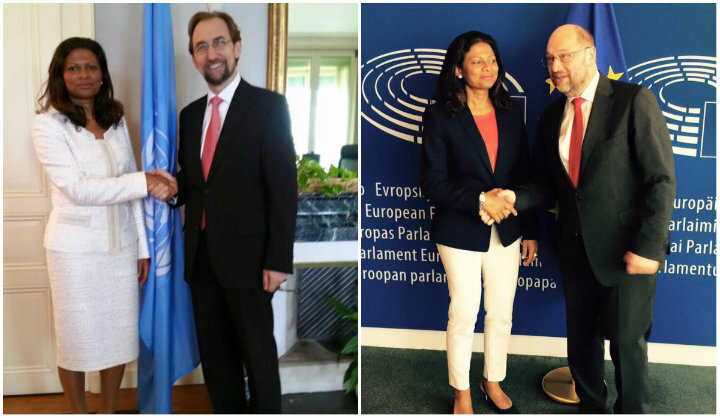 Maldives’ permanent representative to the EU Ali Hussein Didi has criticised the Commonwealth’s involvement in the Maldives, telling the European Parliament that the Commonwealth’s Ministerial Action Group (CMAG) lacked a clear mandate to place the Maldives on its agenda. 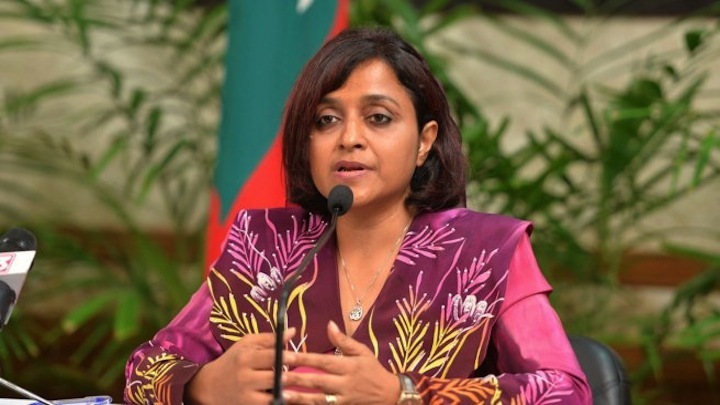 However, in a statement obtained by Minivan News provided to a monthly EU parliamentary session on South Asia, Didi said the situation in the Maldives did not allow for the country to be placed on the Commonwealth’s agenda. “As you would agree, the Commonwealth Ministerial Mission that visited the Maldives from 17-19 February was not able to determine whether any of the above four conditions exists in the Maldives,” Didi claimed. But the government of Maldives will continue to extend “maximum level of cooperation” to the Commonwealth “despite the fact that, in our opinion, the CMAG lacks a clear mandate to place the Maldives on its agenda,” Didi said. In his five page statement, Didi further criticised the CMAG for not responding to requests for assistance to the government’s inquiry into the transfer of power, and reiterated the government’s commitment to holding presidential elections in 2013. He also claimed President Nasheed was ousted in a widespread popular uprising following Criminal Court Head Judge Abdulla Mohamed’s detention and said that normalcy and stability had returned to the Maldives. The CMAG and the EU have called for an independent and impartial investigation into the transfer of power and urged the Maldives to hold an early presidential election within the calendar year. New President Dr Mohamed Waheed Hassan set up a three member Committee of National Inquiry (CNI) to investigate the circumstances surrounding Nasheed’s resignation, but the CMAG has challenged the committee’s independence, and in April warned of “further and stronger” measures should the Maldives fail to review the committee’s composition and mandate. However, Didi supported the CNI’s independence and said the Commonwealth and the United Nations had not responded to requests for technical and legal assistance for the CNI. Didi also acused the CMAG of failure to respect understandings reached by the Maldives government and the Commonwealth’s Special Envoy Sir Don McKinnon. He did not provide details on the nature of the understandings reached between the government and McKinnon. “Yet, I note with regret that the understandings we reached with the Secretary General’s Special Envoy, H. E. Sir Don McKinnon has not been respected by the CMAG or the Commonwealth Secretariat. The cooperation we give to the Commonwealth is not reflected in the statements issued by the CMAG. My government would therefore need the assurance from the Commonwealth Secretary General that the organisation’s interaction with the Government of Maldives is serious and that any understanding reached with the Government would fully be respected,” Didi said in his statement. He also provided details on the government’s efforts to make the CNI acceptable to President Nasheed and to solicit international assistance. Didi further claimed President Nasheed had not exhausted domestic legal avenues for justice. “His own party’s Vice President Alhan Fahmy, MP, called for a parliamentary inquiry into the events that led to transfer of power. However, this was also later withdrawn from Parliament when Nasheed decided he did not want inquiry from taking place,” he claimed. Fahmy had submitted the resolution to Majlis’ National Security 241 committee. Nasheed’s Maldivian Democratic Party (MDP) MPs said they had walked out of the committee because the committee was chaired by MP Gasim Ibrahim who they accuse of funding the alleged coup d’état. Didi noted the EU’s call for early elections, but said that July 2013 was the earliest date allowed for elections in the constitution. Further, an early election could not be held while the Office of the President continues to be occupied, he claimed. “When Maldivians voted in 2008, they voted for a President and a Vice-President. Every vote that Mr Nasheed received was also received by Dr Waheed. The Vice- President is elected for the primary purpose of filling the office of the President, should it become vacant during the term of Presidency, for any reason,” the statement said. Didi also assured the EU parliament that “stability and normalcy” had returned to the Maldives. He alleged corruption was “endemic” in Nasheed’s administration and claimed that President Waheed had set up a “High Level Task Force” to ensure compliance with the Anti- Corruption Commission and Auditor General’s reports and recommendations. Nasheed left the Maldives at the verge of bankruptcy, Didi alleged, saying that Maldives’ debt had risen from 46 percent of GDP to 88 percent of GDP during Nasheed’s tenure. “A team of IMF officials that visited the Maldives a few days back issued a stern warning to the Government that unless painful measures are taken urgently, the Maldives faces economic and financial crises within a matter of few months,” Didi claimed. Didi claimed President Nasheed resigned following “a widespread popular uprising” after Nasheed “abducted” Criminal Court Chief Judge Abdulla Mohamed. The judge was not granted access to a lawyer or family for 22 days and refused to obey a Supreme Court ruling to release the judge, spurring a series of nightly protests against Nasheed, Didi said. “The Government’s response to the protests was the use of tear gas and arrests. Simultaneously, however, hundreds of convicted criminals were released from the prison, and were put on the streets to clash with the protesters,” the statement read. After 22 days of protests, Nasheed’s administration ordered the police to withdraw from the streets, “and the protesters from both sides were left to fight physically and the security forces were ordered to do nothing,” Didi said. “Following this, orders were given to arrest the police officers, who had intervened, upon their return to the Police Headquarters. At which point, majority of the police force decided to join hands and took their position on the square in front of the Police Headquarters and MNDF Head Quarters. Then began the police and armed forces stand-off. In the ensuing time, President Nasheed decided to resign,” the statement narrated. Further, Ghafoor said Judge Abdulla had been granted access to a lawyer and family members, but had refused to see his family. Hamid also noted that the Human Rights Commission (HRCM) had visited the judge on January 20 and told media that the judge was in good health, and had the ability to freely roam the island. Hamid also condemned Didi’s failure to include in his report the police’s ransacking of MDP offices in the early hours of February 7, the hijacking of state broadcaster MNBC One, and the police’s brutal crackdown on Nasheed and his protesters on February 8.